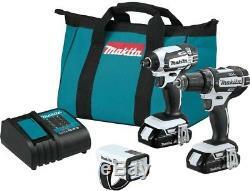 Makita 18-Volt LXT Lithium-ion Cordless Compact Combo Kit (3-Piece) (Drill/ Impact Driver/ Flashlight) w/ (2) Batteries 1.5Ah. The Makita 18-Volt LXT Lithium-Ion Compact 3-Piece Combo Kit (CT322W) is built for the pro user who demands best-in-class Lithium-Ion cordless tools for drilling, driving and fastening in a compact size. The kit includes a 1/2 in. Driver-drill, impact driver, Xenon Flashlight, charger and two fast-charging 18-Volt LXT Lithium-Ion Compact batteries for use with Makita's range of 18-Volt cordless tools. It's part of Makita's expanding 18-Volt Lithium-Ion system, the world's largest cordless tool system powered by 18-Volt Lithium-Ion slide-style batteries. Makita 18-Volt Lithium-Ion batteries have the fastest charge times in their categories, so they spend more time working and less time sitting on the charger. For improved tool performance and extended battery life, Makita created Star Protection Computer Controls. For increased versatility, the tool can also be powered by Makita 18-Volt LXT and Compact Lithium-Ion batteries with the Star Symbol on the battery indicating Star Protection inside. California residents: see Proposition 65 information. Driver-drill with 2-speeds (0-600 and 0-1,900 RPM) delivers up to 480 in. Driver-drill features a compact design at only 7-1/4 in. L and weighs only 3.3 lbs. With battery for reduced operator fatigue. Impact driver with variable speed (0-2,900 RPM and 0-3,500 IPM) delivers up to 1,460 in. Impact driver features a compact design at only 5-3/8 in. L and weighs only 2.8 lbs. Ergonomically designed handles with rubberized soft grips provide increased comfort. Built-in LED light illuminates the work area. Flashlight with 6 LED bulbs for 500-Lumen brightness. 4-position head pivots for versatility. 18-Volt compact lithium-ion BL1815N is compatible with 18-Volt LXT tools. Equipped with star protection computer controls to protect against overloading, over-discharging and over-heating. Compatible with Makita 18-Volt lithium-ion batteries with a star symbol. Only use genuine Makita batteries and chargers. : 12 Batteries Included: Yes Battery Power Type: Lithium Ion Charger Included: Yes Color Family: Teal Cordless Tool Type: Combo Kit Cordless/ Corded: Cordless Power Tool Features: Bag Included, Keyless Chuck, LED Light Product Weight lb. Our stock all ships from our US based warehouses. These products are manufactured according to the specifications of the US Electrical Standards and codes. We assume no responsibility if the item malfunctions or causes an accident because you tried to use the product with foreign electrical standards. The Use with a converter or other voltage transforming device is at your own Risk. The item "18 Volt Lithium Ion Cordless Compact Combo Kit Drill Impact Driver Flash Light" is in sale since Saturday, November 25, 2017. This item is in the category "Home & Garden\Tools & Workshop Equipment\Power Tools\Power Tool Sets". The seller is "familyfirstsales" and is located in Charleston, West Virginia. This item can be shipped to United States, Canada, United Kingdom, Denmark, Romania, Slovakia, Bulgaria, Czech republic, Finland, Hungary, Latvia, Lithuania, Malta, Estonia, Australia, Greece, Portugal, Cyprus, Slovenia, Japan, China, Sweden, South Korea, Indonesia, Taiwan, South africa, Thailand, Belgium, France, Hong Kong, Ireland, Netherlands, Poland, Spain, Italy, Germany, Austria, Israel, Mexico, New Zealand, Philippines, Singapore, Switzerland, Norway, Saudi arabia, Ukraine, United arab emirates, Qatar, Kuwait, Bahrain, Croatia, Malaysia, Chile, Colombia, Costa rica, Dominican republic, Panama, Trinidad and tobago, Guatemala, El salvador, Honduras, Jamaica.